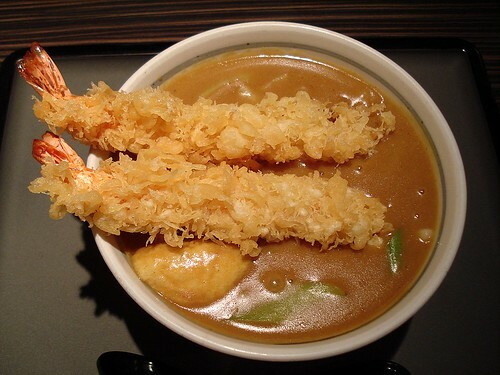 Shrimp tempura curry udon, originally uploaded by Camemberu. OK back to earth, to food, and point-and-shoot photos, for now. After the visit to John 3:16 at Funan Centre, we went to Wakashachiya at the Central (above Clarke Quay MRT) which is just a junction or two away. This time, I vowed to have a bowl of curry udon all to myself. My shrimp tempura udon (about S$16) looked really pretty. Two crispy jumbo shrimps adorned the top of this tasty bowl. Very fresh ones too, with batter that's not greasy. I enjoyed them very much. 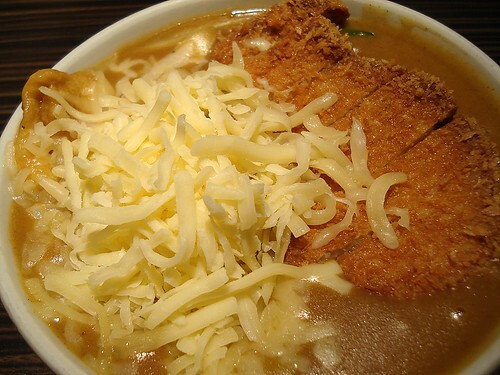 Cheese and katsu curry udon, originally uploaded by Camemberu. Hubby took the cheese and katsu version, topped very generously as you can see. I love the stringy cheese melting in the hot curry. While we both enjoyed the curry udon, we felt that the gravy seemed a bit too thick and overpowering this time. It tasted a lot better when I had just snatches of it the last time. Renkon salad S$6.50, originally uploaded by Camemberu. 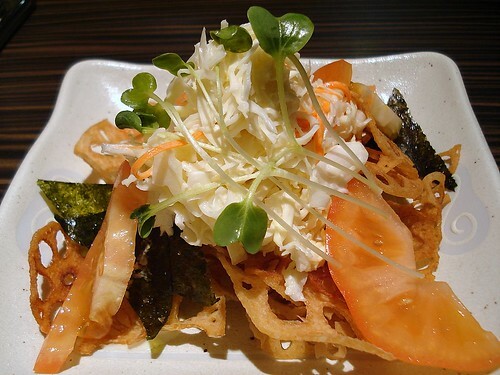 We were very happy to see that the renkon salad (March monthly special) was still available! Of course we had to have it. However, the presentation seems to be a little bit more slipshod. Perhaps someone else was in charge in the kitchen today. Tebasaki - spicy, negi and original, originally uploaded by Camemberu. 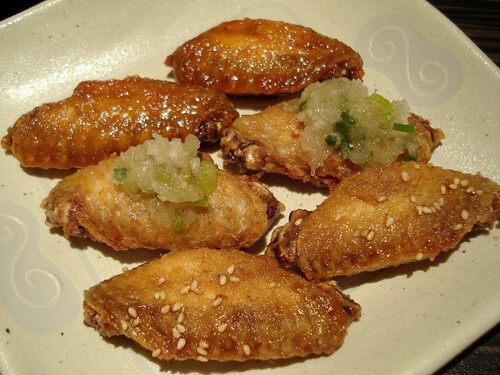 These fried midjoint chicken wings were delicious, especially the sweetly spicy ones. A nice medley of three flavours, but for S$10, they are a bit pricey. I could eat ten at Ya Kwang for the same price. But then again, you're paying for ambiance, comfy seats, and air-conditioning. Wakashachiya can get a bit expensive if you get too many sides but they do use quality ingredients. Service staff (Ann in particular) are always warm and friendly. While we were there, more than half the place was filled with Japanese customers. But one doesn't need their presence to tell this is fairly good food. Wow, you went back again. I also discovered the curry udon recently and forgot that you had blogged about it. I must try this place in Central. i want to try that salad. it looks very appetizing! Singairishgirl, yes do! Let me know if you found any other curry udon place! Momo, it was quite good but too big a portion for me still. Next time I will just share a bowl! Hello Cat, thanks for sharing all your likes and dislikes, esp your WOWS! Those I'll surely check out. As a foodie myself, I like to know where to get value for my taste buds - hey! Keep up with the good work and happy food gallivanting, oh you lucky girl!